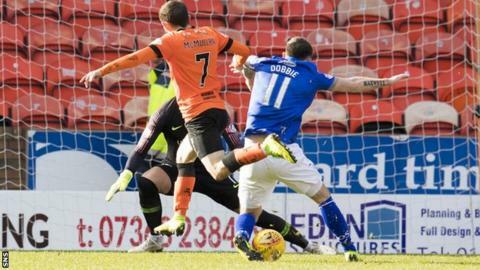 Dundee United missed the chance to go top of the Scottish Championship as Queen of the South claimed a shock win at Tannadice. A second-half Stephen Dobbie penalty and Lyndon Dykes strike ended the visitors' seven-game losing streak. Nicky Clark pulled one back for United, who visit leaders Ross County on Friday trailing the Dingwall club by two points having played two games more. Queens now have a two-point cushion over second-bottom Falkirk. Dundee United manager Robbie Neilson: "I'm disappointed and annoyed as we had the opportunity to go top of the league with Ross County getting beat. "We dominated the game, we had 27 shots on goal, but you have to put the ball in the net. We have to put it right up at Ross County on Friday now in our biggest game of the season." Queen of the South boss Gary Naysmith: "We needed a result after the run we were on. "I thanked the players for showing belief in me because they have never questioned anything I have tried to get them to do." Match ends, Dundee United 1, Queen of the South 2. Second Half ends, Dundee United 1, Queen of the South 2. Corner, Dundee United. Conceded by Jordan Marshall. Substitution, Queen of the South. Connor Murray replaces Stephen Dobbie. Corner, Dundee United. Conceded by Barry Maguire. Attempt missed. Pavol Safranko (Dundee United) header from the centre of the box is just a bit too high. Substitution, Queen of the South. Darren Brownlie replaces Josh Todd. Attempt missed. Lyndon Dykes (Queen of the South) right footed shot from outside the box misses to the right. Attempt missed. Mark Reynolds (Dundee United) left footed shot from outside the box is high and wide to the left. Substitution, Queen of the South. Iain Wilson replaces Ian McGrath. Goal! Dundee United 1, Queen of the South 2. Nicky Clark (Dundee United) header from the centre of the box to the top right corner. Assisted by Peter Pawlett. Attempt saved. Peter Pawlett (Dundee United) right footed shot from very close range is saved in the centre of the goal. Michael Doyle (Queen of the South) is shown the yellow card for a bad foul. Foul by Andy Stirling (Queen of the South). Substitution, Dundee United. Ian Harkes replaces Charlie Seaman. Attempt missed. Nicky Clark (Dundee United) header from the centre of the box is close, but misses to the left. Corner, Dundee United. Conceded by Michael Doyle. Attempt missed. Jamie Robson (Dundee United) right footed shot from the centre of the box is close, but misses to the left. Attempt missed. Josh Todd (Queen of the South) right footed shot from outside the box is just a bit too high. Substitution, Dundee United. Peter Pawlett replaces Samuel Stanton. Corner, Dundee United. Conceded by Kyle Jacobs. Goal! Dundee United 0, Queen of the South 2. Lyndon Dykes (Queen of the South) right footed shot from the centre of the box to the centre of the goal. Assisted by Stephen Dobbie. Pavol Safranko (Dundee United) hits the left post with a right footed shot from the centre of the box. Goal! Dundee United 0, Queen of the South 1. Stephen Dobbie (Queen of the South) converts the penalty with a right footed shot to the bottom left corner.